Authorities in Quang Nam Province have decided to make changes to APEC activities in Hoi An City as numerous venues have been hit by severe flooding since Monday noon, when storm Damrey was battering Vietnam. At a brief meeting on Monday afternoon, Vice-Chairman of the Quang Nam People's Committee Le Van Thanh said a rehearsal at 3:30 pm on Wednesday would be canceled and some sideline activities would be curtailed. The province has also set a target of ensuring safety and sanitary conditions at places where APEC delegations will visit. According to Nguyen The Hung, vice-chairman of the Hoi An City People's Committee, around half of the city is now flooded. As noted by Tuoi Tre (Youth) newspaper reporters in Hoi An, the hardest-hit area was the ancient town where people had to travel around by boat. Floodwaters have paralyzed the main tourism streets, with some places soaked in water up to 3-4 meters. One of them was Nguyen Thi Minh Khai Street, where a meeting of APEC leaders’ spouses was scheduled to take place. 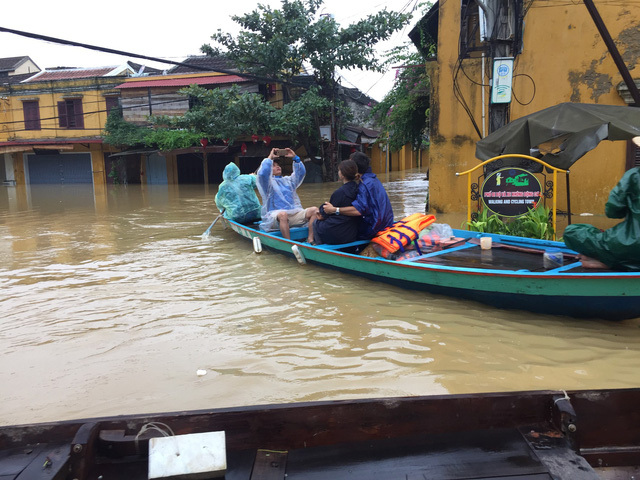 “Some streets like Nguyen Thai Hoc and Nguyen Thi Minh Khai are seriously flooded, and construction works prepared for APEC are also under water,” Vice-Chairman of the Hoi An People's Committee Nguyen Van Son said. “The ancient town, where APEC delegates were slated to visit and take photographs, is heavily flooded now. If the water drains slowly, things are going to be difficult,” he added. According to Vice-Chairman of the Quang Nam People's Committee Le Van Thanh, floodwaters are expected to recede on Wednesday and the province will take urgent measures to clean up the town, with more than 200 officers from the provincial military command and three fire trucks ready for action. “We’ll try our best because APEC is an important event with many activities to be held in the ancient town,” Thanh said. Located on high ground, the Palm Garden Resort, which will host the 'Voices of the Future' forum, is not affected much, however, the surrounding area has turned chaotic as large waves have kept hitting Cua Dai Beach. The 2017 Asia-Pacific Economic Cooperation (APEC) Economic Leaders' Week is taking place in Da Nang, located to north of Quang Nam. The Economic Leaders’ Week, the culmination of Vietnam’s year-long hosting of APEC meetings, is on from November 6 to 11 in Da Nang, and is expected to be attended by some 12,000-14,000 delegates from the 21 member economies. Some events of the Week are scheduled be held in Hoi An, a touristy town. Storm Damrey is ravaging the central coast of Vietnam, with at least 49 people reported dead, scores missing and tens of thousands of houses damaged.